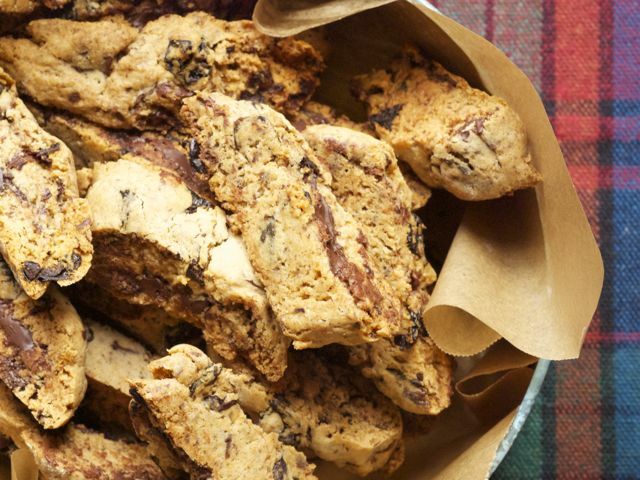 Making biscotti is easier than you think, and they are the perfect hostess gift at holiday time. Think about wrapping the biscotti in cellophane bags tied with ribbon and having multiple packages for co-workers or friends. In addition, they are ideal for a Christmastime cookie-swap party. There are three key ingredients that make these biscotti spectacular: chocolate, cherries, and black pepper. Use a deeply rich chocolate, such as Valrhona Le Noir Amer 71 percent cacao, and chop it into pea-size bits using a sharp chef’s knife; be sure to include all the little shavings, as they melt deliciously into the dough. Look for dried Bing or tart cherries that are soft and plump, usually found in specialty markets. For big pepper flecks, a pepper mill with an adjustable grind mechanism or a mortar and pestle is the best way to grind whole peppercorns very coarsely. Position one rack in the center of the oven and another rack in the lower third of the oven. Preheat the oven to 325 degrees. In a medium bowl, sift together the flour, baking powder, cinnamon, and salt. Set aside. In the bowl of a stand mixer fitted with the paddle attachment, cream the butter and sugar until fluffy, about 3 minutes. Add the eggs one at a time, beating well after each addition. Mix in the vanilla. With the mixer on low speed, add the sifted ingredients in two batches, beating after each addition until the flour disappears. Do not overmix. Using a rubber spatula, fold in the cherries, chocolate, and pepper. Turn the mixture out onto a lightly floured work surface. The dough will be a bit sticky. Divide the dough in half. With lightly floured hands, roll each half into a log 1½ inches thick and about 15 inches long. Place both logs about 3 inches apart on a nonstick or parchment-lined baking sheet. Bake until lightly firm to the touch, about 25 minutes. Remove from the oven and let sit for 10 minutes. Place one log on a cutting board. With a sharp serrated knife and using a sawing motion, carefully cut the log on a slight diagonal into ½-inch-thick slices. Place the slices on their sides on the baking sheet. Repeat with the second log, using an additional baking sheet to arrange the biscotti in a single layer. Bake until dried out and lightly golden, about 10 minutes. Turn each slice over and bake until lightly golden, 10 minutes longer. Transfer to wire racks to cool completely. Storing: Layer the biscotti in an airtight container between sheets of waxed paper. Store at room temperature for up to 1 week. Gift-giving tips: Wrap the biscotti in cellophane bags tied with ribbon, or layer in attractive tins or laminated gift boxes lined with decorative waxed paper. Attach a gift card. To turn this into a gift basket, consider including gourmet coffee and fun, seasonal mugs. Alternatively, include a bottle of vin santo or a digestif, such as grappa, both of which are traditional for dunking biscotti.